New clean apartements close to the beach. Towels were changed daily. There is kitchenette in the appartement but it was even more romantic to sit in their restaurant at seashore. And they cook good traditional greek meals not only expensive fish.. Good place to explore Corfu. Good place for swimming before breakfast. 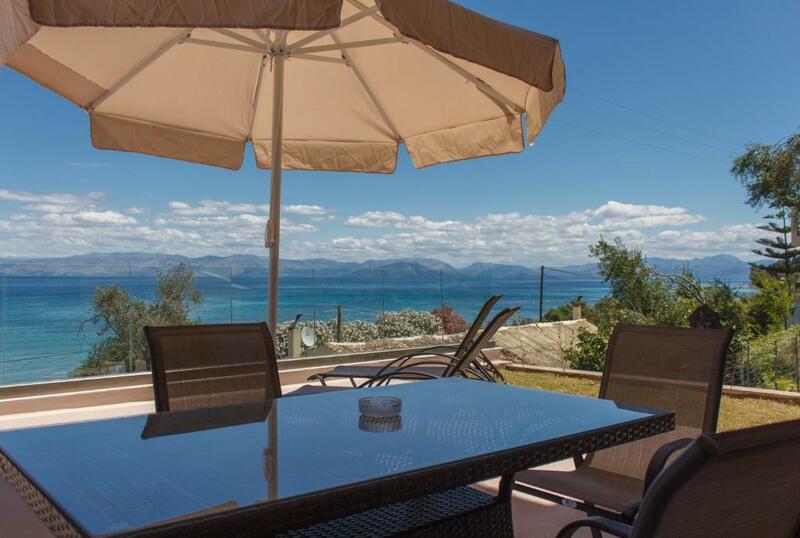 Lovely family run modern villa’s With fantastic views Over the Ionian Sea. Kostas and his Brother were Very friendly and helpful. Fresh strawberries left in our room on our last night. I can not fault, Highly Recommend. We will stay again. View, cleanliness, comfortable bed, nice bathroom, friendly people. Costa was very welcoming and helped us find our way to Boukari on our first night. Very good and lovely stuff. Vlachopoulos family is amazing, very helpful and nice. Rooms were perfect, everyday cleaned and have a great view on the sea. Food in fishtaverna was fresh and very tasty. I really recommend this villa for a trip. I rent a car at the airport and it took cca. 35 min to the villa. We had Deluxe king studio for two persons that was very new, clean and it has a very big terrace with two sunbeds, umbrella and table with four chairs. View from that terrace is awesome. Area near apartment is quiet and peaceful, ideal for adults and those who don't like seaside resorts with a lot of people. The owner of apartment was very friendly and kind, everytime he wondered if we enjoy our stay and whether everything it's ok. There is also room service every day included in accomodation. Views from room and good size balconies. Plenty of excellent tavernas within walking distance. Easy check in and check out, lovely views very relaxing. Very new apartments across from the beach with views across the water. There is a balcony for relaxing and enjoying the view. It was well furnished and equipped. We had a 2 bedroom apartment on the top floor so you do have to carry your bags up the stairs. The location is very peaceful as this is not a real touristy area. There is a taverna just next door and others within walking distance, although the nearest shop we could find was in the next village, so bring some supplies. Very comfy studio, with a big shower and lots of pressure - good after a day at the beach mere meters away. The restaurant of Boukari Beach is excellent too! And the hosts are very welcoming and kind. Their whole family is participating joyfully to the great atmosphere. The area is quiet, which is perfect - we rent a car to go around and when back at Boukari, we know we can relax nicely. Lock in a great price for Villa Boukari Beach – rated 9.5 by recent guests! Providing a private beach area, Villa Boukari Beach provides accommodations in Boukari. Complimentary WiFi is available. All units include a fully equipped kitchenette, allowing guests to prepare their own meals. A toaster and coffee machine are also featured. At the apartment you'll find a restaurant serving Grill/Bbq, Greek and Seafood cuisine. A vegan option can also be requested. Villa Boukari Beach has a terrace. Corfu is 16 miles from the accommodation, while Glyfada is 20 miles away. 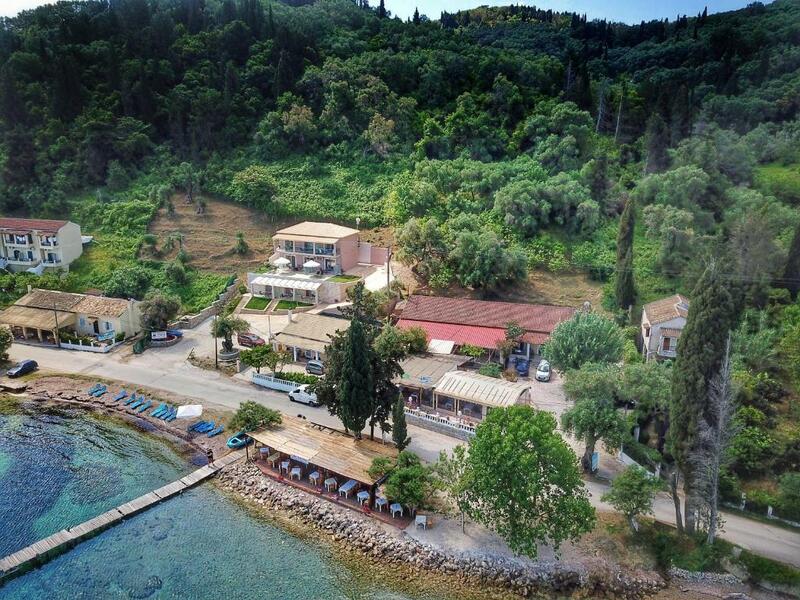 The nearest airport is Ioannis Kapodistrias Airport, 15 miles from the property. This property also has one of the top-rated locations in Boukari! Guests are happier about it compared to other properties in the area. When would you like to stay at Villa Boukari Beach? This studio has a tile/marble floor, kitchen and air conditioning. This apartment features a private entrance, balcony and microwave. This studio has a electric kettle, private entrance and soundproofing. House Rules Villa Boukari Beach takes special requests – add in the next step! Villa Boukari Beach accepts these cards and reserves the right to temporarily hold an amount prior to arrival. Please inform Villa Boukari Beach of your expected arrival time in advance. You can use the Special Requests box when booking, or contact the property directly using the contact details in your confirmation. My only comment would be more utensils and pans in the kitchen. I guess most people eat out...but if you do choose to cook yourself then there isn't much there. There's no microvawe in studio but on the other hand, there's oven and coffee machine. I find the wifi internet slow. You have a enough sunbeds in beach as well, but the entrance to sea was very dirty of some sea grass, we had to go to watter only with flipflops unless we want dirty feets. Cleanliness of equipment mugs plates etc, selection of utensils a bit random and unmatched. A bit isolated unless you have a car. We had an issue with the kettle not working but this was resolved. with 4 adults we did run out of hot water for showering, the hot water tank is quite small for the larger appartment. There was nothing to wash the dishes with and no broom to sweep the floor. From the parking there is a steep little path to reach the building and then stairs to reach the second and third floor apartments. Not really a problem for us but be aware. Also not the apartments problem but the beach faces north so there was no sun all day, would be nice in summer maybe. It would be good to have also breakfast included and coffe, tea in the morning. New and clean rooms. At the beach. Hospitality.